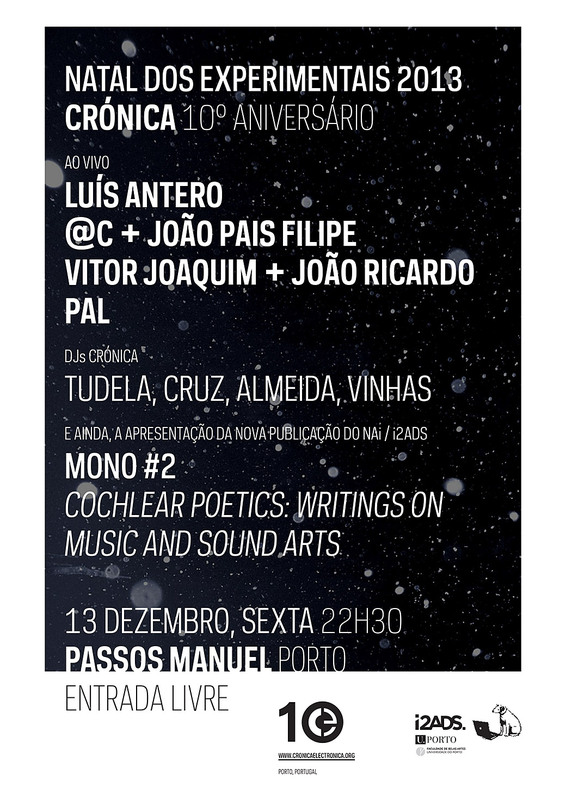 After Coimbra and Lisboa, Crónica celebrates its tenth anniversary in Porto with this year’s Natal dos Experimentais. Next Friday, December 13th, Passos Manuel will host a series of performances and Crónica’s DJs. This year’s program includes live sets from Luís Antero, @c + João Filipe (drums), Vitor Joaquim + João Ricardo and Pal. Kickstarting the evening we will present the latest publication of i2ADS, developed in collaboration with Crónica: Mono #2: Cochlear Poetics: Writings on Music and Sound Arts. This entry was posted in Live, News and tagged @c, Cruz, João Ricardo, Luís Antero, Miguel Carvalhais, Pal, Paulo Vinhas, Pedro Tudela, Vitor Joaquim. Bookmark the permalink. Comments are closed, but you can leave a trackback: Trackback URL.